Single-Session Therapy by Walk-in or Appointment is based on the idea that one session is often all a client will need and choose to attend. The option of a single-session responds to the growing need for greater accessibility and responsiveness of mental-health services. With considerable data supporting both the demand for and the effectiveness of walk-in and by-appointment single sessions, the field is expanding rapidly. This book includes many clinical examples and cultural nuances, as well as discussions of recent research, training and supervision, and implementation and administrative arrangements. 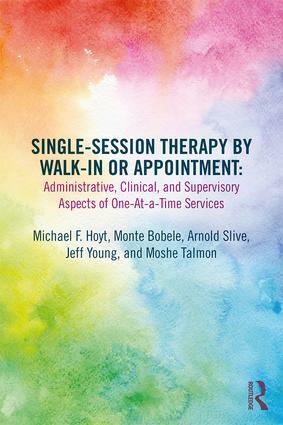 This is an essential title for clinicians, program developers, and policy makers interested in providing the effective, client-responsive, economic option of one-at-a-time single-session therapy on a walk-in or by-appointment basis. "What a great book! From Melbourne to Minnesota, from Calgary to Cambodia, from Sweden to San Antonio, this volume expands our knowledge and skills about Single-Session Therapy — the body of research that now supports it, the case reports that illustrate its many forms, and the training needed to practice in this way." "This informative and engaging book features detailed accounts of single-session therapy and highlights ways to implement walk-in clinics in a culturally sensitive fashion. Kudos to these pioneers for providing innovative ways to offer mental-health services." "If you've believed that clients who attend only one session are treatment failures, think again! There is growing evidence that one session may be all many people need to help them harness their inner resources and resilience. This landmark book is eye-opening, humbling and more than anything else, a must-read for clinicians and administrators alike." "It is propitious to have readily available single-session therapy for those who often desperately seek the relief that psychiatry and psychotropic medications have not and are not able to provide. This book illustrates incisive and immediate interventions for such patients." "Single Session Therapy by Walk-In or Appointment opens our eyes to the power of the single session as a service delivery model that crosses theoretical orientations, cultures, and contexts. This collection offers an outstanding guide for practice." "All the most important authors, the most recent results, and the most important applications are in Single-Session Therapy by Walk-In or Appointment. It is the best resource for anyone who wants to know how to help people in each single -- and often unique -- session." 9. Walk-In Counseling Center of Minneapolis/St. Paul: The Magic of Our Model for Clients and Volunteers. Michael F. Hoyt, Ph.D., is a psychologist based in Mill Valley, California. One of the originators (with Moshe Talmon and Robert Rosenbaum) of the Single Session Therapy approach, he is the author of Brief Therapy and Beyond and numerous other publications. Monte Bobele, Ph.D., is professor emeritus at Our Lady of the Lake University in San Antonio, Texas. He coedited (with A. Slive) When One Hour is All You Have: Effective Therapy for Walk-In Clients. Arnold Slive, Ph.D., is an adjunct professor at Our Lady of the Lake University in San Antonio, Texas. He coedited (with M. Bobele) When One Hour is All You Have: Effective Therapy for Walk-In Clients. Jeff Young, Ph.D., is the director at the Bouverie Centre at La Trobe University in Melbourne, Australia, where he and his team have trained thousands of professionals in the use of single-session therapy and helped many agencies implement SST services. Moshe Talmon, Ph.D., is a clinical psychologist based in Israel. He is a lecturer at Tel Aviv University. One of the originators (with Hoyt and Rosenbaum) of the SST approach, he is the author of Single Session Therapy: Maximizing the Effect of the First (and Often Only) Therapeutic Encounter.